Everyone who travels abroad should plan one special meal, something that will allow you to experience the best a place has to offer. 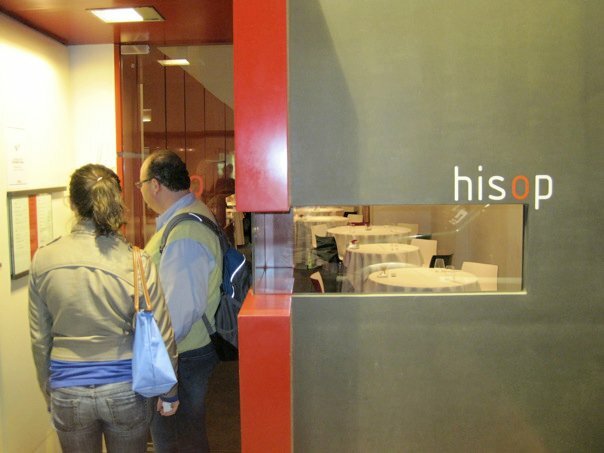 This time around in Barcelona, I went tot he New York Times for my research, and found an article on Bistronomy, the concept of inexpensive traditional food (bistro) combined with the Spanish tradition of experimental gastronomy. Tori, Brenden and I decided on Hisop, and what we found was a delightful menu with something for everyone, even the pickiest eater on earth. In addition to the items we ordered from the menu--two starters to share, three entrées, and three desserts--chefs Oriol Ivern and Guillem Pla offer a series of amuse bouche that echo the creativity and inventiveness of Chef Ferran Adria, the dean of Spanish molecular gastronomy. To begin, we were offered a single perfectly cooked mussel on a cauliflower crema with a finely diced apples and a squirt of parsley jus. Though Be wouldn't touch it, Tori thought this was divine. It was by far the best cauliflower I have ever tasted and the mussel perfect. Next was my favorite bite of the night. A single square of smoked fresh tuna on an roasted aubergine puree with a pistachio pesto. I don't even remember what that dollop on top is, but dear God it was wonderful. The saltiness of the tuna was enough to make you numb from joy. Tori ordered the gambas (shrimp), heads, tails, and all. These were of course prepared in the traditional "al ajillo" (with garlic) style found in Catalunya. They were delicious if ridiculous looking. Foie gras, a gift from God Himself, is the my most favorite delicacy. The perfectly sautees lobe was luscious and silky smooth with just the right texture--something between gelatinous and cotton candy-like, it's there when you bite into it, this in just dissolves into a massively flavor explosion. The sauce is flavored with coffee and chocolate was shaved table side for the final presentation. A single shallot roasted in the coffee sauce added a nice note of sweetness and balance for the foie. Honestly again, partly due to accents and language barriers, I cannot remember what the foam was. I want to say pistachio again, but I have no faith in that memory. Suffice it to say I was in heaven. Now for the entrées. First above is my suckling pig with boletus (mushrooms). This was melt-in-your-mouth pig with cracklin' to make your you cry tears of joy. This was not your supper market pork known for its flavorless profile and chewy texture. 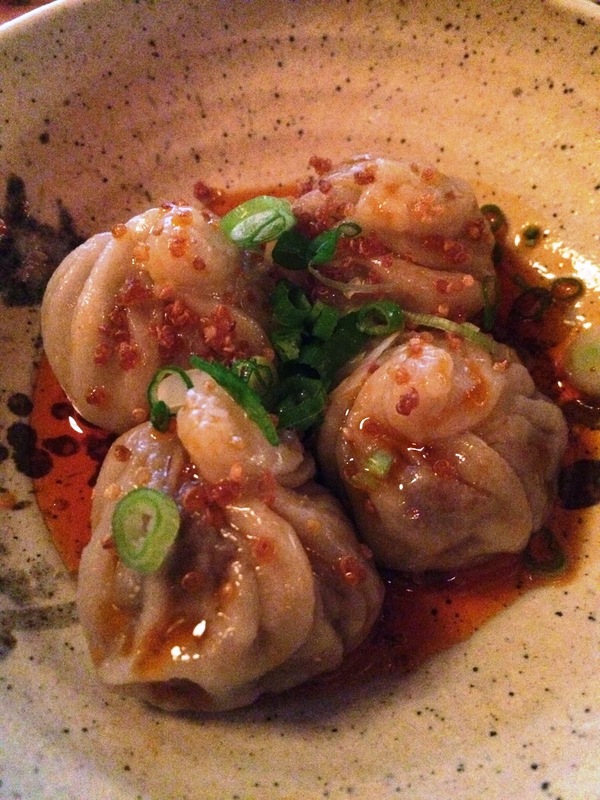 The closest I can describe is heritage pork, the likes of which I have only had at Eno's in Atlanta when Chef Eli Kirschstein of Top Chef fame was there. The pork has flavor bursting from it. This roast pig was accompanied by mushrooms in several forms, most inventively as frozen mushroom dust that was the most fungal experience I would ever choose to have. This was Brenden's deer with salsifis and coffee. It was a work of art. The loin of venison was cooked to just past red and warm in the middle. (Spaniards prefer their meat very rare, so this was a special request.) The coffee was in the sauce, while the salsifis was root vegetables from India, but they tasted like rutabaga or turnips. The surprise on the dish was mango gelato whose sweetness was a marvelous accent to the gaminess of the venison. Yes, Brenden the world's pickiest eater finished it all. Tori opted for the most innovative and experimental combination of flavors, lamb with licorice and curry. This tiny crown roast of lamb packed a ton of flavor. The sauce was licorice flavor, star anise I assume, and the dab of yellow foam was the very essence of Indian curry. A mojito flavored slush was another amuse bouche from the kitchen that was a perfect palate cleanser to help prepare us for the three fabulous desserts that were to follow. This was my roasted pear with blue cheese. A traditional combination, the menu never mentioned that the blue cheese was in gelato form. It was overwhelmingly wonderful. 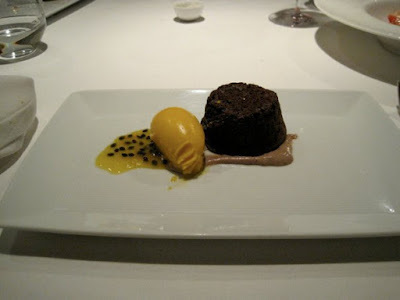 This was Brenden's chocolate molten cake with more mango gelato. If I remember correctly, this was Tori's strawberries with rhubarb gelato. She could not get enough.